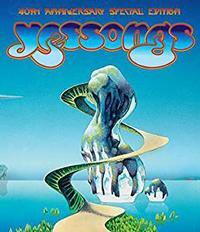 This is a new reissue of the original Yes concert film. While the main film remains unchanged from older editions, there is quite a bit of added material here. I have reviewed the main film before, and will use some of the material from my earlier coverage of it here for the sake of consistency. Other versions of this, though, only included one bonus, and it was the trailer for the movie. That's included here, but there are some additional things that are great. I'll get to those after the section on the main film. As mentioned before, this is from my original review, and it applies equally to this edition. The only true Yes concert film (as in it was shown in theaters as a motion picture) this movie suffers a lot from the time period in which it was made. Granted, this classic performance from December of 1972 is a great time capsule, but filmmaking has come a long way since then. Indeed the sound is weak, and at times it looks like the movie was shot with no light. There are some odd visuals of underwater life and microscopic organisms further complicating the issue. All that said, Yes does put in a great performance. It is important to note that although the live album released at the same time is also called "Yessongs" it is not from the same performance as this film. Among the unusual items on this recording is a short rendition of jingle bells during Rick Wakeman's solo. Now, onto the bonus items. I suppose first we can look at the physical bonus. This includes some cards (more or less the size of the BluRay box) of Roger Dean artwork. That's a nice touch and worth having. Next up, there is an interview section. Covering everything from the making of this movie to the accompanying album, how Dean got involved with Yes and more, this footage is from 2011. Roger Dean, Steve Howe and Chris Squire are interviewed. I found a lot of the interview to be fascinating, and I learned things I hadn't known before. Given the level of my Yes fandom, that says a lot. While the film trailer is also included (as it was originally) as a bonus, there is one other bonus that's very cool, too. It's a short film called "Beginnings." It is essentially a video EP of Steve Howe solo with three music videos for songs from his album of the same name. I don't remember ever seeing this mini-feature before, but I really like it. Each video is distinct from the rest. One features Howe in a duet with Patrick Moraz. This is well worth having. All in all, I am very glad to have this in my collection. While the original film is essentially the same as it was on earlier releases, I feel that the bonus material makes this a "must have" release for Yes fans.